According to recent studies, a significant amount of under-age drinkers, are usually binge drinkers. According to the Huffington Post, more than 90% of alcohol is consumed in the form of binge drinking and on average, underage drinkers consume more drinks per drinking occasion than adult drinkers. The National Institute on Alcohol Abuse and Alcoholism defines binge drinking as a pattern of drinking that brings a person’s blood alcohol concentration to 0.08% or above. This typically happens when men consume five or more drinks, and when women consume four or more drinks in about two hours. Teens are particularly vulnerable to alcohol abuse as their impulse control hasn’t fully developed. Although the legal drinking age in the US is 21, teens usually find other inventive ways to access alcohol. They often use fake ID’s or get older peers to purchase alcohol for them from bottle stores. 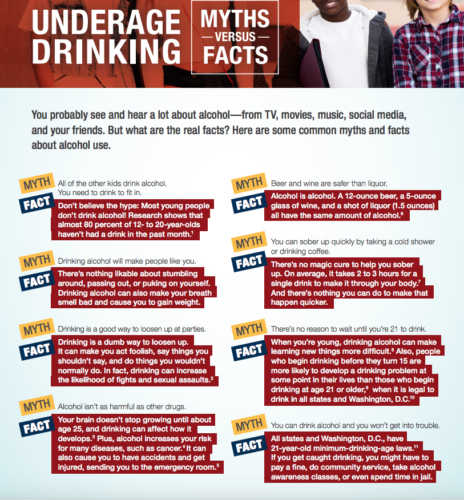 Teens are also influenced by adults in their family drinking, and even if their parents are not alcoholics, alcohol can often be prevalent and easily accessible in the house. Parents should be mindful of keeping alcohol unlocked or readily available in the house. Remember a teen with an alcoholic parent or family member, can already be predisposed to alcohol abuse. Some teens drink due to peer pressure or for fun, while others drink to escape the stressful day-to-day realities they may face at home or at school. Another huge problem with underage drinking is teens who drink and drive. Most have not had a license for very long & don’t think twice about taking their car for a joy-ride while intoxicated. They pose a massive risk to themselves and others. The statistics are frightening for parents. Although most states have very strict drinking and driving laws in place, it sometimes does little to deter a teen looking for a night of fun on the town. Under-age drinkers are often at risk of falling victim to violent crime, sexual assault, homicide and suicide. Researchers also believe that heavy drinking in adolescence can impair brain function later in life. Memory, coordination and motor skills may be affected. Drug use also often accompanies alcohol abuse – and can lead your teen into a downward spiral very quickly. If you suspect your teen may have a drinking problem, approach them carefully, have an honest conversation and seek therapeutic help if needed. It’s vital a teen feels they have a good support system in the home.